Sorghum (and sorghum flour) is one of my favorite grains to work with. It’s not overpowering in flavor, pairs well with many other flavors, and the flour is easier to work with then some of the other gluten-free flours. In honor of the launch of her book (and our general grain geekery), we did a little breakfast collaboration. Pop over to The Bojon Gourmet to see the breakfast tacos made with amaranth tortillas (pictured below)! 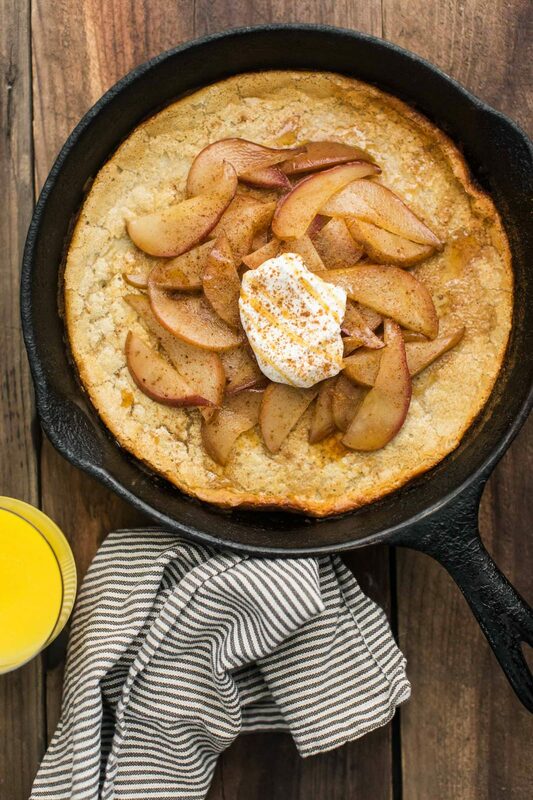 This oven pancake uses my favorite gluten-free flour to make a weekend breakfast treat. Try it with apples instead of the pears! Place the butter in a 10 inch oven-safe skillet with high sides. Set the skillet in the oven for a couple of minutes, just enough for the butter to melt. Core the pears and slice into 1/8 inch thick slices. Remove the skillet from the oven, swirl the butter to cover the pan, and add the pears to the pan. Drizzle with the honey and return the pan to the oven. Roast the pears until tender, 15 to 20 minutes. While the pears are roasting, combine all the ingredients for the pancake in a blender and puree until smooth. The batter will be loose and will possibly separate slightly. Be sure to pulse again right before adding to the pan. Once the pears are done, remove some of the pears so that there is only a single layer of pear pieces remaining. Set aside pears for topping. Pour the batter over the pears and return the skillet to the oven. Bake until the pancake has puffed and is golden, 25 to 30 minutes. Remove from oven. To serve, spoon the reserved pears on top and serve with a dollop of yogurt, extra honey, or a sprinkle of cinnamon. Serve warm. Links: recipe from Alanna Taylor-Tobin’s Alternative Baker. Tips & Tricks: Alanna wants to make sure you nail every recipe which is why she has specific brand recommendations for recipes. Even the slightest variation in the flour grind can change the look of the recipe). Sounds so different! My favorite grain would be rice… But eating brown rice has become very bland to me. I would like to learn more recipes to make it not so bland! Love brown rice flour, and would like to try sorghum flour – have been looking, but isn’t available around here! I would love to learn more about sweet white rice flour. I think I’ve only used it once or twice. I love the roasted pears in this recipe. Looks delicious! My go-to alternative flours are oat, chickpea, and coconut flours. I have never tried sorghum flour but this looks amazing! I would love to learn more about amaranth, because I have never cooked with it before but I have heard it is a complete protein, so I would love to learn how to incorporate it into my diet. Love your blog! I would like to know more about almond flour – seems like a great way to add protein to a dish but i don’t know the best way to incorporate it. Thanks! I have recently been loving buckwheat flour and teff flour. I’m very curious about sorghum! Never tried it before. Might have to go out and get some so I can try this recipe! My favorite grain is spelt! I love the consistency and texture of home-milled spelt, especially in quick breads like muffins! Would love to win this giveaway, I’m a total fan girl of you Erin! You’ve changed the way I view meal planning, grocery shopping and vegetables!! I once made a chocolate cake with teff flour and I became a fan instantly! I haven’t really cooked with alternative flours yet, but want to start. I just saw a show on tv today about sorghum flour that peaked my interest in starting with it first. But that picture seals the deal, that pancake looks delicious! Spelt and oat flour are my go to flours. I have not experimented with sorghum but this sweeter flour is on my list (along with mesquite and chestnut). 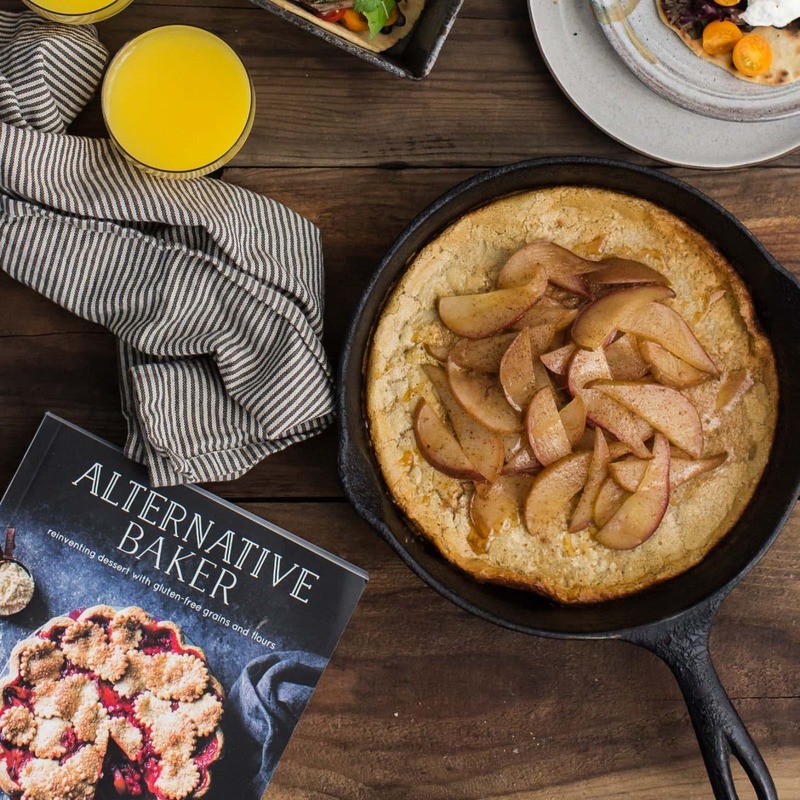 I was just over on Sophie’s blog (The Green Life) commenting on how I need to get my hands on The Alternative Baker because yes, experimenting is fun but it’s nice to have quality recipes to turn to. Anyways, this collaboration is wonderful! You two are fabulous and always putting out beautiful recipes and photos to go along with them. This Sorghum Pancake is no exception! 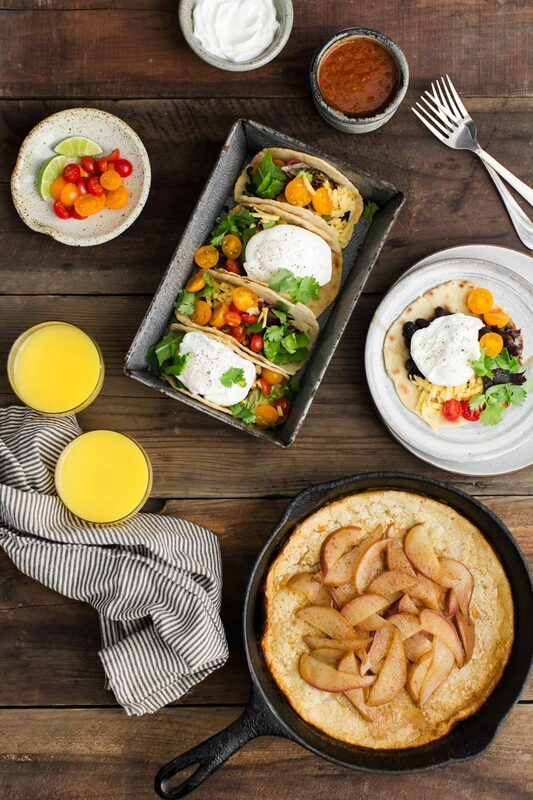 All the fall feels for cozy weekend breakfast. This sounds perfect. I would like to try millet and sorghum. Trying to incorporate more healthy grains into my family’s diet. Thank you for sharing! I’ve started using spelt flour this past year and have enjoyed it. I would like to try some recipes with sorghum flour next. My favourite is oat flour. I just love the taste of it in recipes. I’m interested in trying new types of flours. I’d like to know more about tigernut flour. Love me some almond flour! I love the nuttiness it lends to any sweet treat. This recipe have me very intrigued about Amaranth flour, would definitely love to know more about it. I love using difference flours, rice flour being one of my favorites. However, my children are less than enthusiastic about some. My question is which flour is most similar in taste and texture to white wheat flour? I might be able to win them (all 6) over. Picky little buggers! I am so happy to see whole grains and flours coming back in a new way. They are a great foundation for my diet. I love a freshly cooked pot of pressure cooked short grain brown rice! I am a sucker for corn meal and corn flour. I love the sweet, slightly nutty flavor it gives. I also love adding millet as a topping on muffins and breads. The crunchy pop between your teeth is fantastic! I love oat flour for its versatility, but would love to try sorghum! I would love to try sorghum and oat flour! I’ve cooked with coconut flour before and it’s always come out dry. I would like to try sorghum in my baking. I adore the scent and taste of buckwheat. I’m obsessed with alternative flours – all so different and unique… love the nutty & rich flavour of buckwheat and teff’s almost chocolatey sweetness. The earthy graham/gingerbread-like flavour of mesquite is so cozy, and chickpea is so versatile and great in both savoury & sweet baking… love them all, and I’m dying to get my hands on these beautiful cookbooks and play around more with chestnut & mesquite! Ironically, last night, I was asked to introduce myself by listing a hobby and mine was collecting grains to store in my Weck jars. Erin thank you for introducing me to grains I was unfamiliar with! I am looking for ways to use teff and amaranth and want to know more about substituting one grain for another. Have you ever popped amaranth or sorghum? There are so many great ones it would be hard to choose just one! But some of my go-to flours are buckwheat, oat, almond, sorghum, millet, chickpea, and brown rice. I’m interested in learning about mesquite and chestnut flours. I would love to learn more about coconut flour and its absorbing property! Also buckwheat flour! I have been baking with whole grain spelt flour for awhile… I’m excited to try buckwheat, rye and mesquite. Thank you for loving and promoting whole grains… I feel they have been unfairly demonized because of all the issues with modern-day wheat. Can’t wait to bake with your cookbook! I like to use millet flour and buckwheat flour. I am interested to try amaranth and teff flours! I like chickpea flour, and also buckwheat flour. Yum!! I admit, I’m an alternative flour hoarder with all different kinds taking up space in my pantry. I’ve used and loved buckwheat flour for its subtle earthiness and oat flour for an extra whole-grain boost to my baked goods. I love oat flour and I love eating millet as a grain and cooking with the flour as well. My favorite flour is currently chickpea flour, but I’m intrigued by sorghum flour! Unfortunately, buying experimenting with different flours can be a bit tough on a student’s budget, so I haven’t been able to try it yet. I have really learned to love spelt recently – the flour for baking, and the berries as a side dish or salad topping. Your site has been a great place for me to learn more! I love buckwheat flour! My favorite way to use it is in buckwheat pancakes with mashed up seasonal fruit in the batter! My favorite flour is oat and following it are chickpea and almond flours. I’d loved to learn more about millet and amaranth flours. I was in the bulk foods section at the local co-op scooping some amaryth seed into my little bag, the first time I had ever decided to use amaranth seed (trying to spice up some homemade granola) and a middle aged man scooping some neighboring grain looks at me and said, “ah, amaranth, what a magical grain” and nodded approvingly at me. I was so nervous that he would ask me what I was making with it because I was embarrassed that I didn’t know any other recipe or use for it. I want to understand the magic that that man has discovered with the amaranth!! You totally turned me on to spelt, but now I feel like I’m going to need to explore sweet white rice flour! Thank you for sharing! These books both look so incredible! My favorite flour is sprouted barley in breads and I would love to learn more about rice and amaranth in baking! I love teff flour as a protein packed alternative for breakfast pancakes. Even for a teff porridge – such a great flavour! 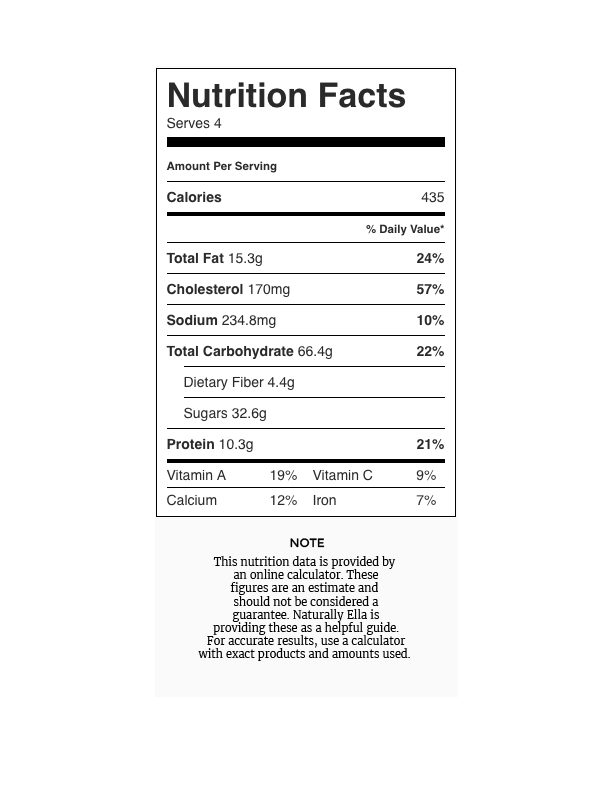 Great post and I am excited to read more about the gluten free flours! I love to cook, but baking has always been intimidating… Even more so now that I’ve learned I have celiac. Lots to learn! I think sorghum is great too! I want to learn more about working with chestnut and semolina flours. I would love to know more about oat flour! I would love to try working with amaranth flour! I’ve been loving oat flour because it’s inexpensive and easy, but I’d love to experiment more! I’d love to know more about chickpea flour, I hear such great things about it! I have recently become interested in experimenting with alternative flours – I can’t wait to find my favorites! I really enjoy cornmeal recipes, especially with the fall weather. I love the complexity of buckwheat flour (and just recently started playing with red flour)! 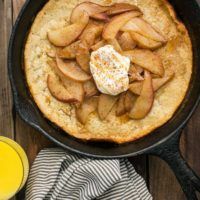 I am interested in learning about how to use sorghum flour-the oven pancake recipe is the perfect place to start! I’ve recently started exploring alternative flours. Oat is my favorite go to, but I love experimenting! I easily get bored so I have a few different grains in my pantry to make sure I have a lot of variety! One of my favorites is an upside down apple cake made with oat flour. Would love to try amaranth and millet too. I would love to learn more about amaranth – I’ve seen it at the store and it looks interesting but I don’t really know what to do with it! I love using sorghum flour! And I’d love to learn more about amaranth flour! I’ve started to try buckwheat flour more and love it! Always up for trying other things! I’m just learning about everything gluten-free. We love your website! We are so excited about the opportunity to potentially win! My favorite grains are quinoa, black rice, and I just tried bamboo rice which is delicious! I also like sorghum. This recipe sounds delicious, looking forward to trying it. I am a gluten-free baker, too, and sorghum is my favorite! Love the mild sweetness and soft texture. I love using oat and almond flour, but I would really like to get better at using sorghum flour! This is such an awesome giveaway, Erin! I’ve been using a few sprouted flours recently – brown rice, millet, and kamut. The sprouted grains give a nice texture to breads. I like to use whole wheat mixed with white in recipes. Thanks for the recipe. I love buckwheat flour, but It’s so difficult to find the lighter kind here in the states- I end up buying it at international markets! I love using buckwheat flour. It has such a yummy, earthy flavor! I want to try using teff in the future. Thank you for the giveaway opportunity! Sorghum and Kamut flour. Super interesting sounding! Also, I can’t wait to check out both of your books! I would like to know more about using spelt. Oats are probably my favorite grain. I’d love to learn more about baking with buckwheat flour! Chickpea flour is the best. We all have different tastes and I’m always trying something new. I’m a big almond flour fan, but I’d love to try sorghum! I currently have only used Bob’s 1:1 flour and rice flour so I am wide open to trying different gluten free flours. The sorghum sounds as though I would really like it. I just discovered The Bojon Gourmet site a few days ago and now your site — what serendipity. I bought some cassava flour to make Brazilian cheese balls and now I am curious about how else I can use it. I really like oat flour and would like to learn how to cook more with nut flours and chickpea flour. My favorite grain these days in Kamut. However, I’m always interested in learning about other grains. I just ordered some teff, which I’ve never had before, and am interested in re-trying amaranth, which I had years ago. I don’t bake that much, so I’m not sure about using different flours, but am always open to trying new things. Thank you for this and for your cookbook (I hope I get a copy!). I’m still learning about gluten free cooking, but have been eating Bob’s gluten free oats for breakfast daily. They are the best. I’d say the flour I’m most interested in is Amaranth! I just picked up two bags of spelt flour at the store today bc one of my recent favorite cookbook love and lemons keeps using it baking. I’m ready to try it tomorrow about would sooooo love to check out your cookbooks and bake and eat my way through new flours! Love making oat flour for pancakes! Cheap and quick alternative to using regular flour. I haven’t tried amaranth yet – so I’d like to try that! I love using spelt flour!! I would love to learn more about oat and spelt flour! Cooking with alternative flours is still new to me but I have enjoyed the little I have been able to try so far. I love buckwheat flour and would love to cook more with chick pea flour! It has been fun and still so delicious to try cooking with more types of whole grain flours! Have been GF for about 6mo. now, and slowly learning to explore alternate grains. Loving the versatility of millet- it can be a great stand in for rice, bulgar wheat, or couscous. I am so jazzed about this contest that I am happily commenting on both blog posts! As far as my favorite flour is concerned, I have such a soft spot for buckwheat flour… the nutty flavor, the beautiful earthy color, the texture of finer Amalfi Coast sand… (in the best sense!) Buckwheat flour feels REAL and comforting and solid. I would also love to learn more about how to use hazelnut flour! As a celiac who loves to bake, I want to give Bob of Bob’s Red Mill a hug every single day. My favorite alternative flour/grain to bake with is sorghum! I also love popped sorghum. One flour I’d love to experiment more with is teff. I love the fact that it’s high in protein. I love your blog and seeing your pics on Instagram! I love baked pancakes!! Or anything resembling a dutch baby in fact. And sorghum is an accessible tasting flour to use – for even the pickiest of eaters. And I have several of those in this house! I love this idea and will certainly be making it for a weekend brunch soon. Thank you for yet another great recipe!